THE AFP SHOULD BE HELD ACCOUNTABLE FOR THE CONTINUING ATTACKS AGAINST LUMAD SCHOOLS AND COMMUNITIES! 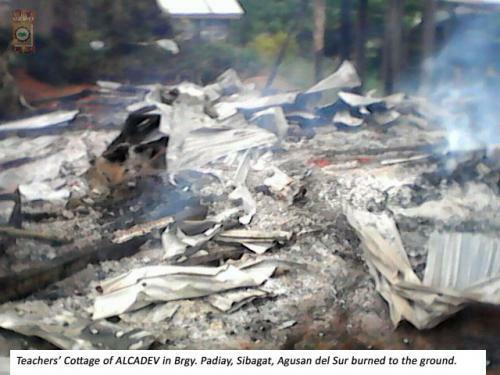 We strongly condemn the recent burning of our ALCADEV satellite school in Sitio Km. 30, Brgy. Padiay, Sibagat, Agusan del Sur! At around 2:00 in the morning of November 12, six unidentified men burned down the teachers’ cottage destroying books, school supplies, instructional and learning materials, stocks of rice, power generator set, audio-video equipment, sewing machine, kitchen utensils and farm tools. About 5,000 banana and abaca seedlings in the school nursery of hardwood and fruit trees located adjacent to the cottage were also destroyed. The Armed Forces of the Philippines (AFP) 4th Infantry Division Spokesperson Capt. Joe Patrick Martinez misleads the public with his statement that “the school was not damaged.” The classrooms, dormitories, teacher’s cottage, equipment, facilities, demonstration farms and all else inside the school compound are integral part of our school. In fact, this incident has not only damaged the school but even destroyed the seeds of education and livelihood which the school is nurturing to help the community. AFP was quick to deny its responsibility over the burning of our school but incidents before this recent attack point to their culpability. The Eastern Mindanao Command immediately released a statement cleansing the Army’s hand over the incident, alibied that there were no military deployments in the area. They, however, are lying as elements of the 23rd Infantry Battalion – Philippine Army (IBPA) and Special Forces of the AFP were in nearby Sitio Bantolinao for “community organizing for peace and development” (COPD), only 3-5 kilometers away from the school, when the incident happened. The military detachment of the 23rd IBPA is even located in the center of Brgy Padiay, less than 5 kilometers away from ALCADEV. 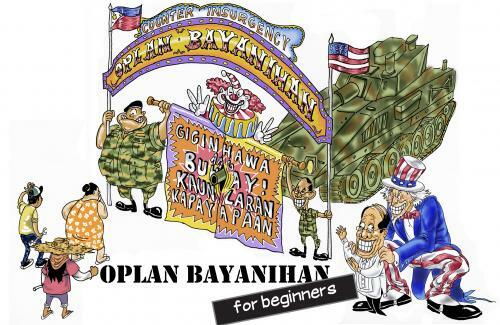 Operating units of the AFP, particularly the 23rd IBPA has been vilifying the school as New People’s Army (NPA), harassing teachers and students during their COPD and combat operations. Last April, elements of the 23rd IBPA arrived in the area and has since then been going around the neighboring communities, including Km. 29 and Km. 30 for COPD and combat operations. In June of this year, six soldiers, introducing themselves as members of the 23rd IBPA attempted to enter the school grounds of ALCADEV to “census” the students. The teachers refused saying that armed men are not allowed to enter schools grounds in protection of the rights of the children. In August, about 60 soldiers believed to be from the 23rd IBPA and Special Forces of the AFP arrived in Km. 29 and encamped in the teachers’ cottage of the Balonbon Elementary School and the School for the Lumad by 7th Day Adventist (SULAD), under civilian houses and in the purok waiting shed. For two days they went about the community, listing names of residents and asking them about ALCADEV. The military men constantly warned residents from joining progressive organizations, vilified the school and its teachers as NPA and had been telling residents to burn the school. The people refused, saying that the community themselves established the school with the help of ALCADEV. The AFP is accountable for the recent burning incident, the continuous attacks on our schools and Lumad communities. The AFP is attempting to cover-up the crime by conveniently excusing the perpetrators as “impostors” citing that Army uniforms and military backpacks were recently procured from an accredited tailoring shop in Butuan City and deduced that these were used for the disguise of the perpetrators. The AFP is trying to blame the NPA for this atrocity while continuing its vilification of ALCADEV as an NPA school. In desperation to save their blood-tainted reputation, the AFP made lip-service in condemning this recent incident. They continually insult us with their declarations of protecting the Lumad people on one hand and vilifying our school as NPA training grounds on the other. The statement made by the 401st Infantry Brigade (IBde) Commander Col. Alexander Macario, that “any school facility should not be an object of any attack,” has been belied by their burning of schools, vilification and harassment of teachers and many other military abuses in the course of the AFP’s COPD and combat operations. During the fact-finding mission in our Han-ayan main campus, we have found only chaos and destruction as the 75th IBPA continuously occupies the school and civilian communities under its so called mandate to secure the area. The AFP deployment in the Caraga region now reaches 11 full battalions with 2 companies of Special Forces under the 401st and 402ndIBde. With this much deployment of State security forces, attacks on Lumad schools and communities continue with impunity. We are still grieving, yet another attack has been done against our school. We call for peace based on justice. Our beloved Executive Director Emerito Samarca was brutally murdered right inside the ALCADEV School in Han-ayan, and Lumad leaders Dionel Campos and Datu Juvello Sinzo were executed by identified members of an Army-backed paramilitary bandit group right in front of hundreds of community members. It has been more than 75 days since the Lianga massacre and we are counting off more days of injustice. We did not abandon our school in Padiay. We were forced to leave because of the threats on our very lives. All the staff and students in ALCADEV School in Padiay evacuated after the September 1 Lianga massacre and sought sanctuary in Tandag City together with more than 3,000 internally displaced Lumad. We continue to hold classes despite difficult conditions in the evacuation centre. We are very much looking forward to returning to our communities but only to find our schools burned and destroyed. The Lumad people persevered to establish the schools and develop communities in the absence of government services. Where is justice when the fruits of our own efforts get destroyed and the State security forces deny any responsibility over it? Where is justice when innocent people are slain by Army-backed lawless elements? 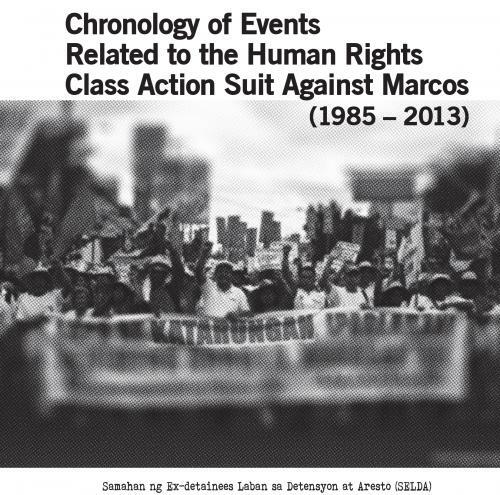 Our calls for justice are resounding yet the BS Aquino government remains deaf. We raised our calls to various agencies and officials of the government in search of justice but the perpetrators of the Lianga massacre remain at large; no one is arrested and prosecuted. The Army-backed paramilitaries continue its rampage in our communities and its leaders are being coddled by the AFP when we are calling for it to be disbanded and disarmed. Not a single commanding officer of the AFP has been held accountable; they are even rewarded with more troops. We are calling for the pull out of the Army yet more than two battalions has been additionally deployed to further intensify AFP’s military operations. Are we to expect more violence and destruction in response to our calls? Our existence emanated from the demand of the people and our perseverance contributes in realizing the aspiration to educate the Lumad children. We received recognition such as the National Literacy Award for the selfless offering of our lives and dedication to educate the marginalized. The AFP justifies their action as part of counterinsurgency operations and we are among those that are continuously being attacked. 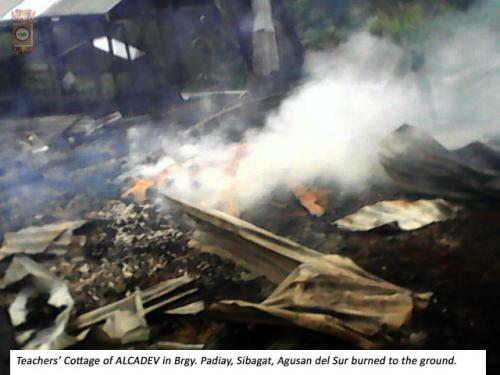 Stop AFP attacks on ALCADEV and alternative learning schools! Justice for the victims of State-sponsored violence!